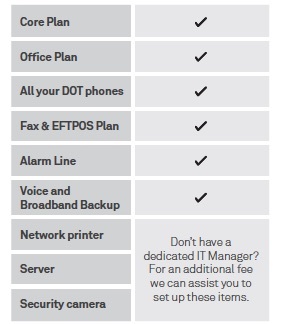 CDM Phone Systems Perth and Telstra bring you DOT (Digital Office Technology)™. DOT is an all in one digital office solution that places you in control of all your telecommunications. With DOT, you can combine fixed lines, mobiles and business broadband on the same account and on single bill. Plus, it gives you access to a range of software and applications that help make it easier and simpler to run your business efficiently. You can move your Core Plan up or down if your needs change. Our plans come with included standard call options, to help you better manage your costs. Your Core Plan provides you with a business broadband service and a digital telephone line, plus smart calling features. An Office Plan gives you additional voice lines to your Core Plan. You get a call allowance, smart calling features, and you have the option to add a new phone. Choose a Mobile Plan which gives you a voice and data allowance, plus you can choose to add a smartphone. Choose a Mobile Broadband Plan to use when you’re out and about – connect your tablet or laptop and share your data allowance with your DOT mobiles. After your installation, we’ll call you and provide a one hour, over the phone, Post-install Support session about how to use DOT, including advice about online tools and confi uring your DOT hardware.For an additional fee we can come to you for a two hour onsite Post-install Support session, where we’ll demonstrate how to use DOT. We’ll also help you to confi ure your DOT hardware (available in metro areas only). If you want your handsets located in a different location to your router, we can also arrange fixed price cabling for you. Save with free calls in Australia between phones on your DOT account. Share your call and data allowance. You can share your allowances across plans of the same type, so your Core Plan voice allowance is shared with your Office Plan, and your mobile allowances are shared across your mobile plans. Be flexible and mobile by making and receiving calls on your compatible device looking like you are using your fixed desk phone number when you’re on the go. Data charges apply in addition to standard call costs. Great calling features including simultaneous and sequential ring features so more calls can reach you. Use Voice2Email to access voicemails through your email, so you can manage and listen to messages from your computer. With our Peace of Mind Commitment, eligible new business customers receive no fixed broadband excess data charges for the first two bills. You get one account and a single bill to keep things simple. Get round-the-clock support from our technical experts.